Text and pictures by Charlie Hulme, May 2008. I offer this page to provide some information and points for discussion regarding some potentially useful cycle routes in the Davenport - Bramhall area which are currently not officially available to cyclists but could be useful ways to get around away from motor traffic. 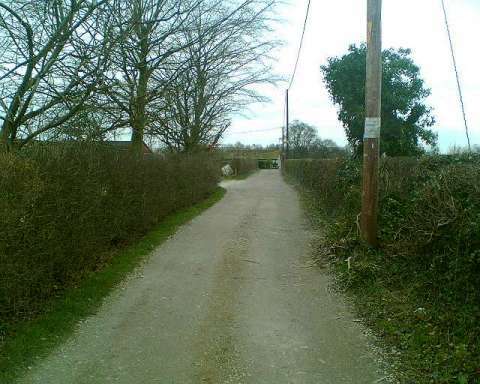 I appreciate that it is 'against the law' to cycle on a public footpath, in that you are committing a trespass against the owner of the land; it is not the same as cycling on the roadside pavement, which is an offence. (It is, however, definitely an offence to 'cycle inconsiderately' on any sort of route.) Then again, if you can show that a route has been used by cyclists for 20 years, you can apply to the Council to get it re-designated. 'A' is the link between Beechfield Road and Frewland Avenue which gives access from the Bramhall direction to the (useful if time is not of the essence) marked cycle route via Edgeley to Stockport. Unfortunately, this short link is not marked yellow on the Stockport Cycling Map, like other such links it appears to be left to the imagination of the reader, as a mysterious gap between two dead-end recommended routes. 'B' is the route across the old Mirrlees golf course (pictured above) connecting Woodsmoor station to Bramhall Moor Lane, legally a public footpath (and so not shown at all on the Stockport Cycling Map), although the majority of it is traversed in cars by anglers accessing the fishing pool at the Woodsmoor end from Bramhall Moor Lane. The surface of much of this route, and the connecting path to Flowery Field, was treated to a new surface in 2010. 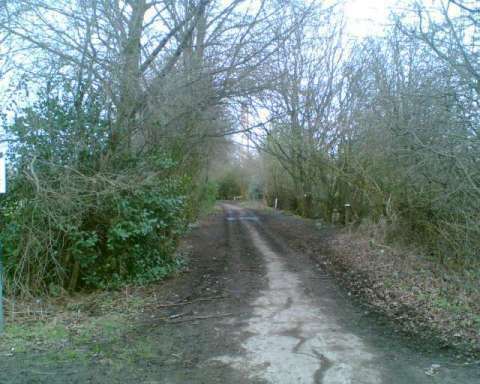 It is a very pleasant, if rough, country lane which forms part of an excellent route from Davenport across Mirrlees Fields towards the very cycle-friendly Sainsbury's store in Hazel Grove. The Cycling Map offers a route through Stepping Hill Hospital as an alternative, although this is quite busy with traffic, and has a gate locked at 9pm. 'C' is the bridge over the railway which was built by the Midland Railway Company in 1901 as access to the now-vanished farmhouse of New House Farm. 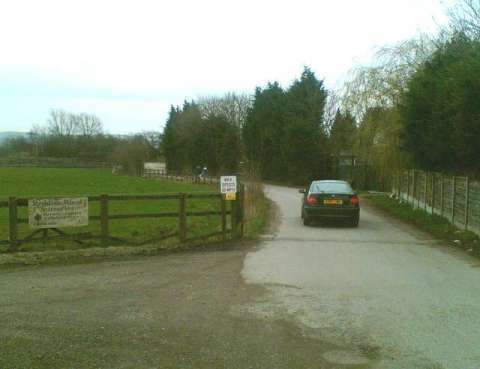 Currently it is blocked by a fence, which a very narrow gap at one end (behind the wooden post on the right of the picture) allowing thin pedestrians through - making it impassible to cyclists even pushing their bikes, so it is necessary to walk bikes through a narrow subway, shared with a stream, to reach the New House Farm estate (with its shop and pub) from Woodsmoor without using busy Bramhall Lane. 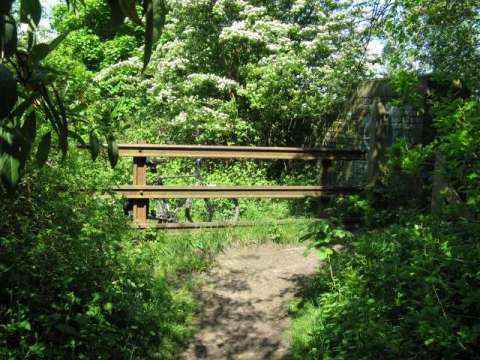 This railway is a major barrier for cyclists: a bridge which once existed to the west of Bramhall Lane was removed many years ago. 'D' is the very useful track (above) - used by vehicles for access along its whole length (but 'officially' a footpath and so not shown at all on the Stockport Cycling Map) - connecting Lytham Drive in Bramhall to the Hazel Grove - Woodford Road, on which one can turn right for a short distance, crossing the border into Cheshire, and turn left just before the railway bridge to access the byway (legally available to cyclists) leading to Poynton, and routes beyond up towards the Middlewood Way. 'E' shows, for information as they are outside Stockport, the useful network of old lanes and railway inclines in Poynton which are currently unadopted roads with rough surface and marked on the map as public footpaths even though they are wide, have houses on them, and have no barriers for use by all traffic. A great mystery to me is how a member of the general public is meant to know whether a particular route is allowed or not allowed. If a road shown in white on the OS map also has public footpaths marked along it, is it more restricted to cyclists that a road shown in white without any other markings? All very puzzling. 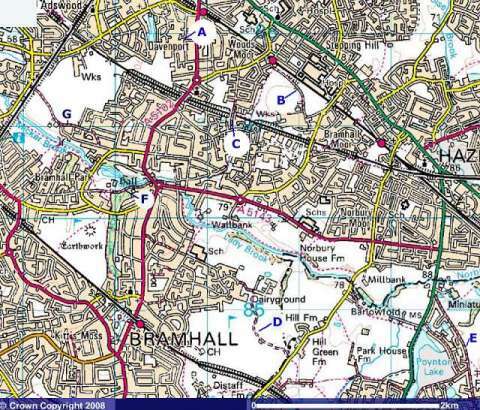 'F' is the drive of Bramhall Hall, a useful traffic-free link, although it is used by cars at times when the Bramhall Hall management wish it. It is fully-metalled - and, oddly, has a 'no cycling' sign at one end but not at the other. It is not shown on the Stockport Cycling Map, although it is on the property of Stockport Council. 'G' is Tenement Lane, a very old country lane - the name comes from Linney's Tenement, a farmhouse which it once reached. 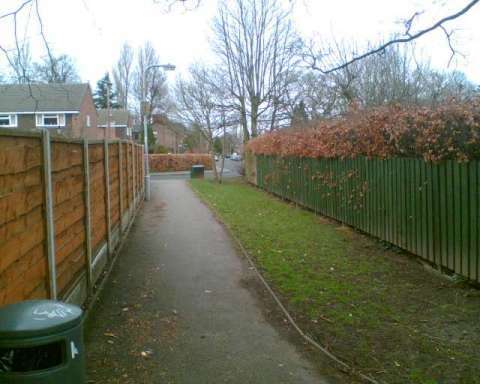 It it is mostly metalled, and links with a marked route on the other side of Ladybridge Road towards Cheadle. Tenement Lane is shown on the Stockport Cycling Map, even though it too is shown by OS as a white road marked as a footpath; the residents often lock a gate across it, leaving a gap for cyclists but blocking the route for vehicles. I include this on my list to question how a cyclist, keen to obey the law, but without a copy of the Cycling Map, would distinguish this route from the others in B and D above? The 'Stockport Cycling Map' I refer to above is Map 7 of the Greater Manchester Cycle Network maps published for CycleGM by the Greater Manchester Passenger Transport Authority in 2006 and issued free through Council information offices. Although useful in some ways, these maps are unsatisfactory, largely because of the decision to give no indication whatsoever of any places where one might usefully 'walk the bike', and by the omission of the majority of street names, making it hard to use them for real navigation.